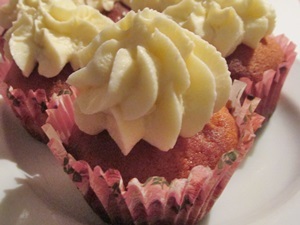 The recipe for elderflower cupcakes is a marvellous spring dessert for a sweet desert or cake for tea. If there is spring and the endless rain does not wash away all the delicious blossom pollen. 2013 this gets a little difficult to find elder bushes which are not yet withered. This autumn we will definitely get plenty of elderberry. If you were able to grab some elderflowers you can get straight to our popular recipe for elderflower cordial. If you were not that lucky: you can buy ready made syrup and cordial as well all year long and add the wonderful smell of these blossoms to cupcake and muffins. 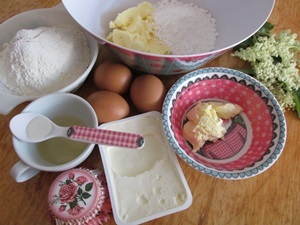 For the dough: Mix sugar and butter, add one egg after the other, mix cordial and lime juice to the batter. In a separate bowl mix flour and baking powder and add it to the batter spoon by spoon. Fill your muffin tray with 12 muffin liners and fill in dough into the muffin cases. Bake for about 15 minutes. 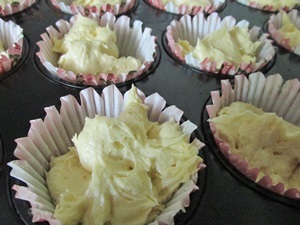 For the frosting: again start by mixing butter and powder sugar, add cream cheese and start adding the cordial bit by bit. Make sure that the frosting is not too fluid. Cool the frosting for at least one hour in the fridge. As soon as the cupcakes are cold your can pipe the frosting on top of them. With a piping bag we piped the topping. 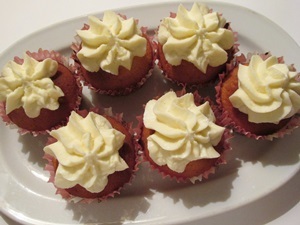 For piping our elderflower cordial frosting we used the star tip size 12mm. If you have some fresh elderflowers at hand you can rip them of their little stems, add 1-2 drops of lime or lemon juice to them and crystallize them with granulated sugar. Server immediately as the blossom quickly turns brown. What is the difference betweens cupcakes and muffins? To be honest we make the following differentiation: muffins are small cakes in muffin cases and cupcakes are small cakes in muffin cases with a topping or frosting on top. That is not exactly what the dictionary would tell you. 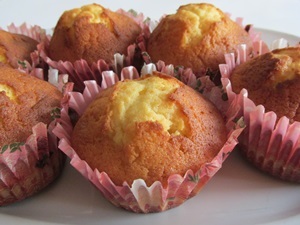 Classic muffins and cupcakes do differ in the way the batter is mixed and what is included. But as we interpret muffins and cupcakes in a middle-European way – less sugar, no added artificial flavour, no artificial colours, no bake mix and other chichi, our cupcakes differ from the US-American cupcakes. And why do we do this? Because we do present recipes we like to cook and we like to eat. 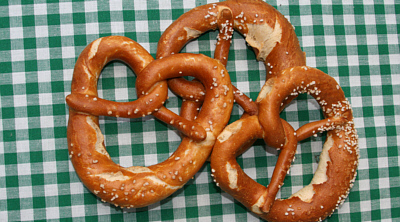 That is the same we do with typical and traditional Austrian food we present here as well. We, e.g. use less fat (be it butter oil or lard), use fresh herbs, where in deep winter dishes were only seasoned with salt and maybe a dash of pepper.